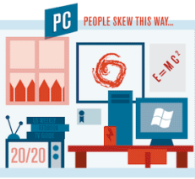 What Determines If You're a PC or a Mac? It's unscientifically official. PC users are more lame than their Mac-using counterparts. An unscientific survey by Hunch, a website that makes custom predictions based on your interests, shows that PC users tend to prefer fitting in with others, are less tech savvy, and prefer Hollywood films over indie films. The same survey suggests Mac users tend to throw more parties, are modern art enthusiasts, and would rather drive a Vespa than a Harley. 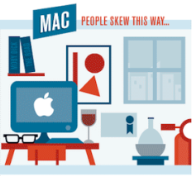 Looks like that four-year-long, 66-commercial "Get a Mac" campaign had some truth to its stereotypes. Hunch was able to arrive at its conclusions by asking its user base if they self identified as a Mac or PC person. It then looked their answers to various other interest-related questions and grouped them with answers from other users that identified themselves the same way. It's a gold mine of stereotypes. CNN's Brandon Griggs said of the survey in his article, "The results suggest Mac users can be seen, depending on your perspective, as bolder and more creative -- or elitist and more pretentious." Before I go any further, I should note that I self identify as a PC person, even though I use a Mac most of the time at work. Like Hunch's data suggests of PC users, I live in the suburbs, seldom throw parties, am not a fan of modern art and enjoy the occasional lolcat. And don't think the irony is lost that this article is appearing on PC World, not Macworld. Apple users are 80 percent more likely to be vegetarian than PC users. PC users' soft drinks of choice are Pepsi, Jolt Cola and Orange Crush. Apple users prefer San Pellegrino Limonata and Boylan's Root Beer. Apple fans get their news from 60 Minutes, The Daily Show and The Colbert Report. PC users watch The Rachel Maddow Show, Newshour with Jim Lehrer and 20/20. Make sure to stop by Hunch's blog to check out the rest of the data packaged in an infographic made by Column Five Media.